This is a U.S. WWII sweetheart or patriotic pin. It was worn to show patriotism or in support of a sweetheart/loved one who was in the military. It is small measuring 5/8 of an inch wide by 3/8 of an inch in height. It is made from copper and has a black enameled center with the letters USA. The reverse has a pin back with a swivel catch to hold the pin in place. 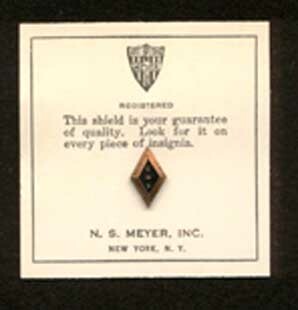 It was made by N. S. Meyer, Inc., who made insignia for the military. The pin is new on the card of issue.